This homemade air freshener gel recipe is an easy, all-natural way to add your favorite fragrance to your home’s air. As we become increasingly aware of indoor air pollution dangers, many are choosing to replace commercial cleaning products with all-natural homemade cleaners. We shouldn’t stop there, however. Air freshener sprays and plug-ins other sources of volatile organic compounds (VOC’s) linked to cancer, including several banned under federal law. Labeling laws don’t require manufacturers to disclose the specific ingredients in their air fresheners or cleaning products. If you or someone in your family have allergies, that lack of transparency can lead to a lot of unnecessary discomforts. So, the real question is: why would anyone want to spray that stuff around their home? With homemade air freshener gels, you can have beautifully-scented air while knowing the exact ingredients you’re using, and you can enjoy those things for just pennies! 1. In a measuring cup, sprinkle the gelatin over 1/4 cup cold water. Let it soften 5 minutes. 2. Meanwhile, bring 3/4 cup water to boil in a small saucepan over high heat. 3. Immediately remove the pan from heat and gently stir in essential oils, and salt. (The salt helps prevent mold growth.) If you are using liquid food coloring, stir it in now. 3. Pour the softened gelatin into the hot water and stir until combined. Next, gently stir in 1 cup of cold water. 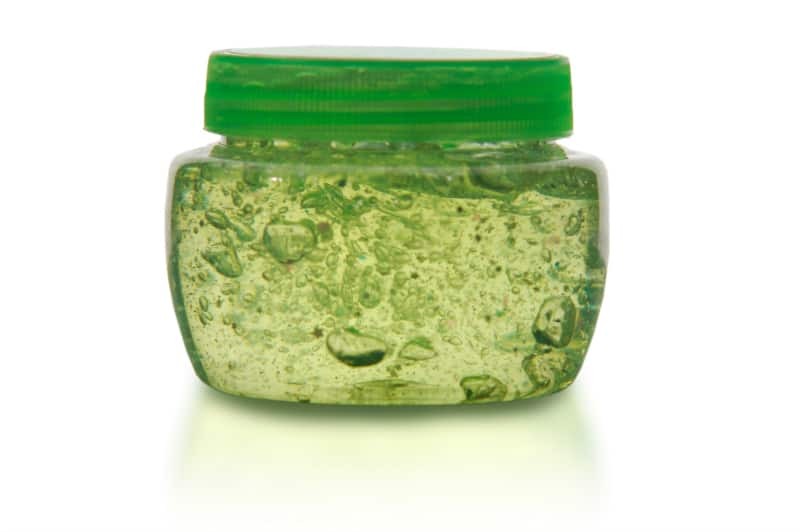 Do not stir vigorously or it will foam up and create a cloudy gel! 4. Place the jars on a towel-covered countertop or cutting board and carefully pour one-fourth of the gelatin mixture into each container. Let the contents set-up overnight then put the lids on. 5. Store unopened jars in a dark, cool place and use within three months. Coming up with a signature scent for your home is part of the fun of making this homemade air freshener gel recipe. Here are a few ideas to help you get started. Citrusy – Orange, lemon, grapefruit, and spearmint. Fresh and clean – Lavender and lemon. Autumn spice – Bergamot, sweet orange, frankincense, and cinnamon. Winter woodsy – Balsam fir, cedarwood, cypress, and lemon. Romantic floral – Rose, geranium, and neroli. • Decide how many air fresheners you plan to use right away. Poke five to six holes in those lids using a hammer and nail. Leave the remaining covers without holes to keep their fragrance intact during storage. • If you want to make the cap attractive, prime and spray paint it before hammering in the holes. Or cover it with a beautiful scrap of thin fabric hot-glued around the rim. Just be careful not to clog the holes with hot-glue! • One 8-oz container of air freshener gel will scent an average-sized room. For larger rooms, use more than one jar. • Keep the homemade air freshener gel away from direct sunlight. Don’t place the jars directly beneath ceiling fans or in front of air vents, or their fragrance will evaporate quickly. • If you use a lid with holes, the homemade air freshener gel in each jar will last approximately one month. If you don’t use caps, you’ll need to replace them more often. NOTE: This post first appeared on March 16, 2012. The recipe has been improved and the post revised for republication. Hi,thanks for the tips on air freshener. But please can the glass jar be substituted with a plastic container with a lid? Humble regards. The only problem you might face with a plastic container is that it could melt when you pour the hot mixture in, but if you use a thick enough container that might not happen. Does the gel evaporate? Or can you re-use with new scent? Curious before I make them. Thank you! How long once you have poked holes in the lid does it last? Very interested in giving this a go! Once you’ve poked holes in the lid they last around a month if you’re careful to keep them away from sunlight. Sorry I didn’t see this in time to answer. I hope it all turned out well! Could you use Gain fireworks instead of essential oils? I really have no idea. 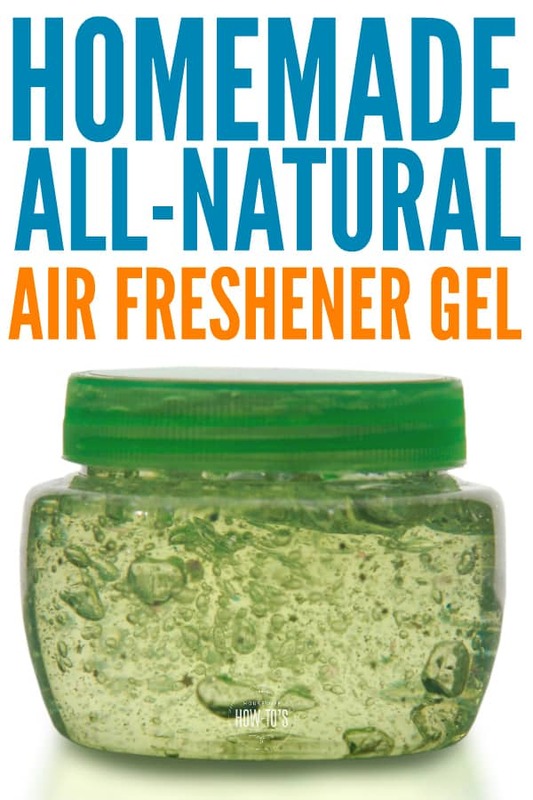 The idea behind making homemade air freshener gel is to do away with using commercial products since we have no idea what’s in them and they aggravate many peoples’ allergies. If you give it a try, let me know how it turns out! I would love to do this, but does it have to be essential oils? I LOVE coconut smell so I was thinking of using coconut oil, because there’s no such thing as coconut essential oil, but would the smell still last? I have no idea if coconut oil would work but I suspect the gel wouldn’t set up properly since coconut oil has a different viscosity than essential oils. If you’re bent on coconut, perhaps try coconut fragrance oil in place of the essential oils. It’s similar in viscosity to essential oil but would still have the scent you enjoy. just a clarification: we have to leave them to set with the lids on right? Also I’m wondering, just to save on all those lids, one can buy a few extra containers (or spar elides if possible) and make a hole in this elides and then when you want to use the gel jar, just replace the lid. Or just remove the lid and cover with a few layers of cling film with holes in it, and then cover with a nice cloth tied with a ribbon? You can absolutely use one set of punctured lids and swap them out. That’s what I do. I imagine the cling film would work, too. Let me know if you try it! Hi there! Tried your air freshener spray with cloves and vanilla extract and loved it. Going to try your gel today. Wondering how long will the gels stored for? How long will the gels last typically once you have them in use? Thanks in advance. If I make and store them without poking holes in the lid, they’ve lasted for months. That’s good, because I tend to make a huge batch and store them in my closet for future use. Once you’ve punched holes in the lid they last around a month. This. Is. Brilliant!! I love clove oil and the air freshening ability of it but was getting tired of putting drops of it on my light bulbs. I’m so going to try this. Thanks, Katie! You’re welcome, Margi! And, hey, is it just me or does the smell of clove oil take you back to our heyday in the 80s?